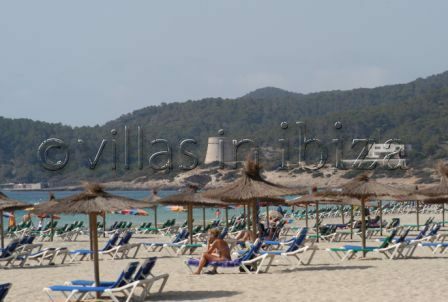 Playa Den Bossa is located just outside of Ibiza town and is a favorite with people that like their clubbing holidays. This is mainly due to it being the home of the famous Bora Bora beach bar and is also just a few minutes walk away from Space. Both venues are open all day, and with Space offering a pass out (where you can leave the club and return again later in the day), it’s an ideal place to chill before, after or during your clubbing sessions. Although you shouldn't be fooled into thinking this beach is only for those that like to party. It is also one of the longest stretches of beach on the island, and if you head to the other end of the beach you will find a much more relaxed atmosphere. The beach is directly in the flight path of Ibiza airport so you do get several low flying planes overhead, but generally this only adds to the Ibiza experience. I consider Playa Den Bossa about the best place to sunbath and swim in the world. The slope of the beach is perfect, the sand grain size perfect, the water temperature perfect, the surf perfect. It is a fabulous place. Runner up would be San Antonio Beach near Alicante on the Mainland.